GoSports Turns 10! Celebrating 10 years of enabling sports excellence! “We are what we repeatedly do. Excellence, then, is not an act, but a habit.” The team at GoSports Foundation believes firmly in this adage, and also believes that athletes who are working to achieve their potential can inspire countless others to strive for excellence. We work to provide sporting talent the right support at the right time, to give sporting talent a fair chance to blossom and build athletes that will alter the notion of what it means to be Indian. 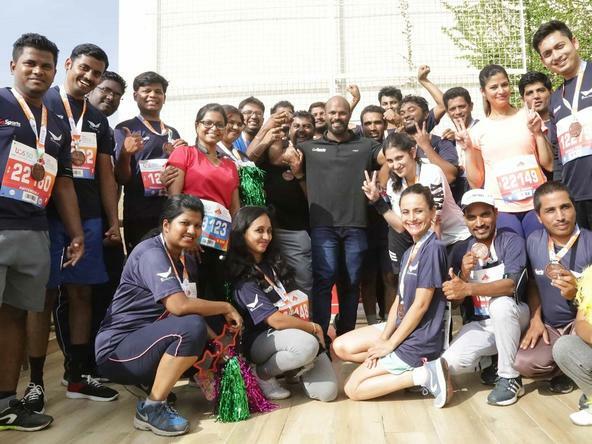 This programme has been set up to support and mentor elite athletes across Olympic sports who have the potential to be catalysts of change for Indian sport. This programme has been set up to provide financial aid and sports science support to scientifically groom emerging athletes across Olympic sports to become international ambassadors for Indian sport. This programme seeks to support India's elite and emerging differently-abled athletes as well as bring structure, planning, and vision to the Indian Paralympic Movement. This programme focuses on creating role models across bright, young, able-bodied talents from a targeted age group, in 5 sports to make the Indian sporting ecosystem truly inclusive. I am happy to be helping GoSports Foundation in my own small way along with a few friends to raise funds for their programmes. Being an ex-athlete, I understand the necessity for proper funding to be extended to sporting talent from an early age. A talented athlete needs all the support possible, which may vary from sports science interventions to participation in international tournaments for exposure to develop him/her into a world class athlete. Backing from corporates plays a big hand in sport development, along with Government funding. Therefore, it is crucial for more brands and individuals to come out and support sports through their CSR funds and help in putting India on world sporting map. We initiated the association with GoSports Foundation’s Para Champions Programme as we felt there was a huge need to support sports in India. Indian para athletes have been carving their own paths for a better quality of life for themselves and their families and we felt that this programme not only provides them with support but also ensures that their achievements are celebrated on par with able-bodied athletes and at the same time opens up the door for differently-abled individuals to regard sport as a potential career option. As responsible sports broadcasters, we want to create awareness of their stories with the long-term vision of growing the sports narrative in India and hopefully influencing policy makers in the process. The Para Champions Programme matches this ideology and supports top elite and emerging para athletes in their sporting endeavour. Year 1 of the Para Champions Programme saw 11 of the para athletes under the programme participating at Rio 2016 and 3 returning with medals. We were delighted to acquire the rights to broadcast Paralympic highlights and ensure that audiences back home could celebrate the athletes’ achievements and take inspiration from their performances. We are happy to have since expanded our support to work with able-bodied athletes through the other GoSports Foundation programmes, and ensure that our sporting champions get the support they require and deserve in their sporting quest. "Inlaks Scholarships and Grants provide opportunities to young people with exceptional talent in any field to broaden their horizons and enhance their skills, thus making them a force for change in their professions. We were delighted to launch our sports scholarships through GoSports Foundation in 2012 and support young sportspersons on their way to becoming role models and champions in their respective disciplines. It was also humbling for me personally to participate in their interview process and meet some of these champions in person and more intimately understand the various routes they have taken to sporting achievement. We are delighted to continue our support to them and participate in some form in the journeys of athletes who are well on their way to becoming beacons of inspiration for future generations of sporting talent." While my parents and coach Nandi Sir have always been with me and encouraged me in my pursuit of gymnastics, the scenario of the sport in India is quite different from the other countries. The assistance from GoSports Foundation has played an active role in helping me build my career, assisting me in my dream to inspire many other youngsters to come out and take it up. GoSports Foundation began supporting gymnastics through me, since the time I was preparing for my first ever Olympics. Post Rio, I injured my knee and the foundation introduced me to their network of experts who helped me in the rehabilitation process. I was out of competition for more than a year and have been thankful to have their support at every step to get my fitness back.